Why are the edges of my barrel cactus turning white? This is typically caused by under watering or sun scald. 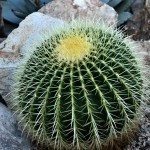 While it is a cactus, it does need some water and if it has been drier or hotter than usual where you live, you may need to give it some supplemental water. Sun scald typically happens with plants that are not use to the sun yet, such as a plant you just bought from the store and then set out in your garden. It is the sun burn or the plant world. It can also happen if you suddenly get a hotter, harsher day that you typically would have for that time of year. There is not much you can do for a plant once it has a scald, but they can normally recover from it on their own.